Not to tell a tall tale but, this is the story of what really happened between Pavlov and his dog. Every Thursday Pavlov took his dog to the park for a run. Where he met up with his fellow scientists, and discussed the finer points of digestion, and chuckle about how many art school rejects turn to Socialism as a means of striking back for their own inadequacies. Pavlov, one of the most prolific talkers at the park, often became lost in conversation, and would forget to take his dog home to feed him. Now Pavlov’s dog was no ordinary dog. He was endowed by having an intellectual as a master. After listening to the garbles of rhetoric that spewed from Pavlov’s mouth. He had learned a few things. One day after running around the park for several hours, he waited for Pavlov’s to finish his sentence. When he realized he was hungry as all get out, and desperate for something to eat. What was he to do? The other dogs lay at their masters feet, and waited patiently, or did a trick when they wanted a snacky treat. He was not so lucky, Pavlov was immune to such musings, the simple tricks of pet owner psychology failed. And Pavlov’s friend Foucault, goaded him into talking more of his theories. If he didn’t do something, he was sure to starve. He would not be docile or led, and picked up his leash and growled at Pavlov. “Stop talking.” he barked. “I’ll chew your shoes.” the dog growled. He wouldn’t be discouraged. Hunger can drive a dog to do many a thing. Out of desperation, to get Pavlov’s attention he barked and dry humped Foucault’s leg. But Pavlov gave no heed, neither his scent nor the micro features on his face gave any indication that he cared. “Definitely an art student.” Pavlov dismissed the behavior. The dog’s hackles went up, if his efforts weren’t good enough. He had to get to the heart of the matter, and let Pavlov know. Standing close to Pavlov he lifted his leg, and laughed as only a dog can. It worked, he had his attention, but Pavlov pulled him by the collar, choking him, and took him home. So angered was Pavlov, he tied him to the porch, and forgot to feed him. Now he was hungrier than ever, and struggled to break free. At wits end, his neck sore, he lay down and began to chew. Being an intellectual by association the dog deduced that Pavlov had worms, devised a plan to cure him, and headed out into the garden. Where a plant grew that he ate when he suffered from worms. A feeling of hope came over him as he dug. This might be his chance to win Pavlov over and make him a better person. He’d feed him. He wouldn’t have to leave home after all. But where was his plant? He sniffed the garden. There was a fresh layer of manure down. He couldn’t smell anything. He barked and listened for advice, but the neighborhood was silent. There was only one thing to do. Dig. It worked, Pavlov came out to the garden to see what all the fuss was about just as he found what he was looking for. He dropped the plant at Pavlov’s feet. But Pavlov only saw his destroyed garden, and swung his shovel to brain the mutt. “Blasted cur!” he cried. Worn out from the digging and dodging, he cowered under the moon lit silhouette of the shovel. That’s when Pavlov noticed the only plant dug up was garlic. Being a digestion specialist Pavlov knew that garlic would cure his worms. He dropped the shovel and gave the pooch a big hug. As a reward to the dog every afternoon Pavlov would appear at the back door and ring a bell to call his dog in for a treat. “Intellectuals shape societies morals and belief structures. Not the ones who check gasoline levels using a lit match.” Pavlov. Eric, can you contact me through my blog so I can get you over to share some of your fab recipes and punt you book. Halloween approaches and I like to deck out October as spooky months so maybe something along these lines? I love this combination of entertaining tale and wonderful recipe. 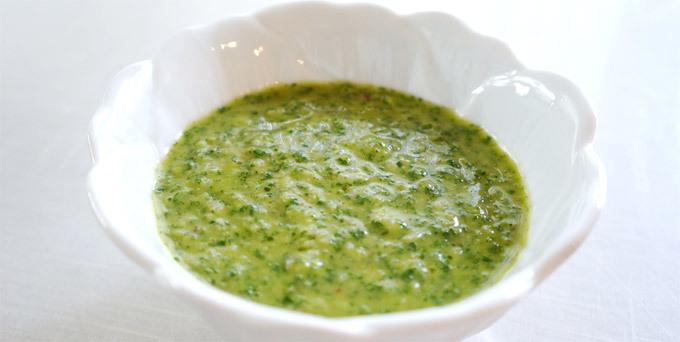 The story of Pavlov’s dog and this Chimichurri Sauce are a great combination of food to nourish body, heart, mind, and spirit. I look forward to more of your #MondayBlogs entries!